2. Tease it a few days early. 3. Post a picture of the box. 4. Unbox it, take photos. 5. Test it as a sound bar, a Bluetooth speaker, and any other capabilities. 6. Post a first impressions. 7. Further test it, find out the extent of what it can do. 8. Compare price to performance and to other speakers I already own. 10. Post that review to my blog. Thank you! Here’s my simple plan to review the product. I want to make my review simple and to the point. No sugar coating. People like honest reviews! compare sound quality of each source. 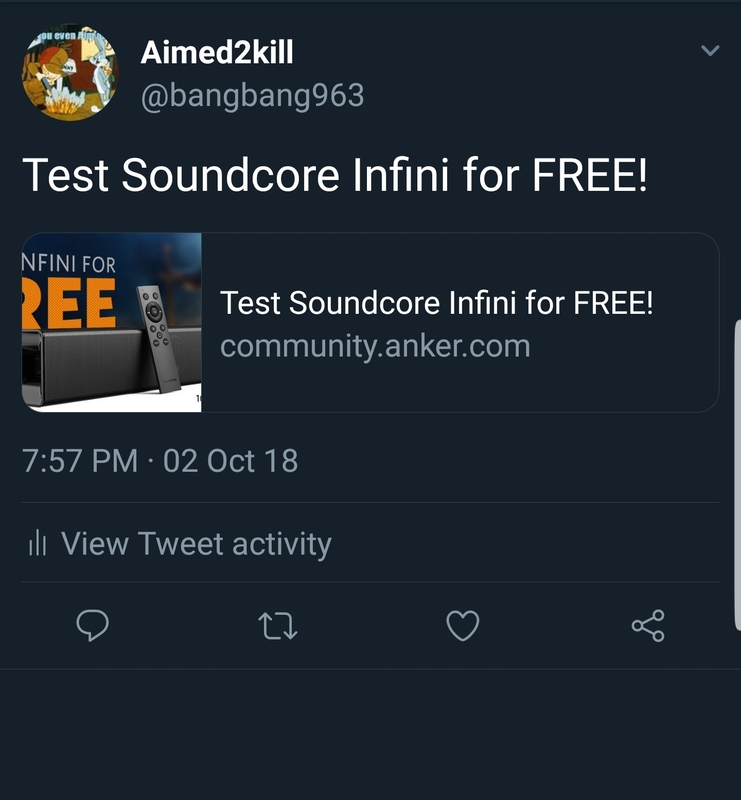 Write report on how Soundcore Infini performs. 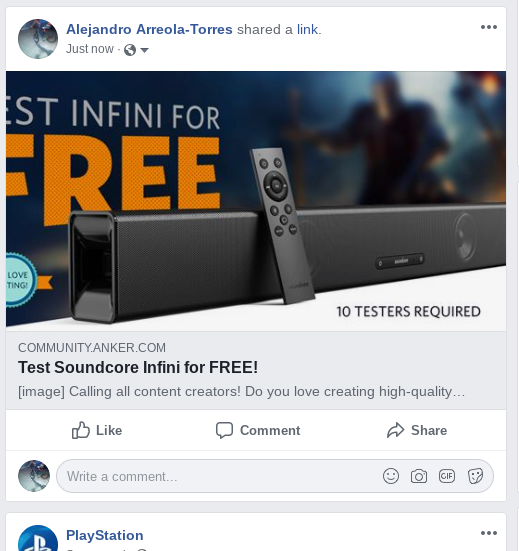 • I don’t not currently have a sound bar so I would compare it to the TV sounds, showcasing the value that it would bring to individuals looking for an entry level sound bar. I am not sure why it won’t let me post the photo but here is a link to my photo. Would love to test out your new sound bar. Would do a review video through YouTube with unboxing and testing its different settings. Would then post links of the review on Facebook and Twitter. My plan will be to provide an honest, unbiased, and in-depth review as always. If there is any aspect of the specifications you would like me to test and display result please let me know. I plan on making a 10+ minute, content and data heavy review to be posted on YouTube and linked with my other social media platforms. You may review this before I post it but I do not revise my reviews without good reason. I am hoping to use this product in future projects as well. So there is potential for extended exposure for your product via my content. Thank you for your consideration! Hope to hear from you! 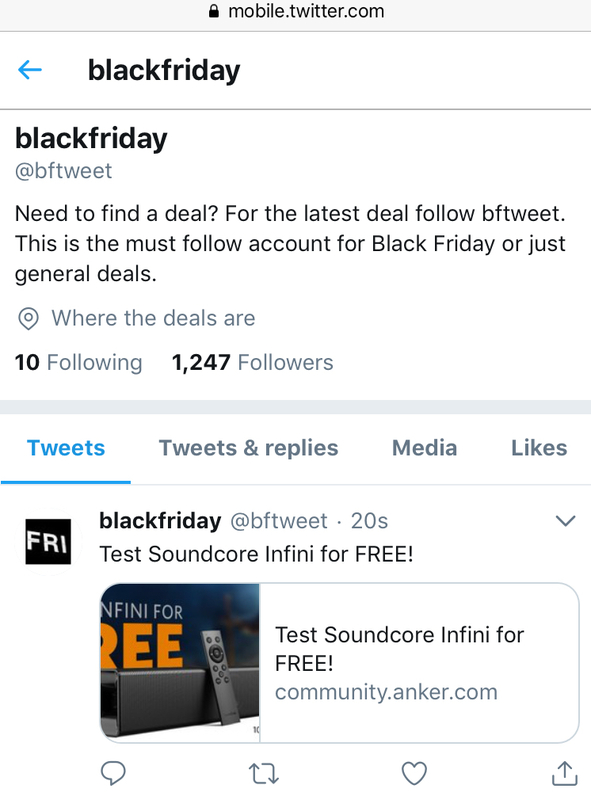 I would love this opportunity to test one of Ankers latest sound equipment. I'm a huge fan of their charging and battery storage products. Being a former Bose corp. technician I understand the sound qualities necessary in a home theater or musical environment. My favorite characteristic of great sound is imaging. To hear this from a soundbar would be pretty incredible. 4. Sound: From dynamic movies/sports/music videos to music/pristine recorded tracks (SACD)/wide dynamic range tracks/foot tap ability tracks/and last but not least, bass tracks. I already have my tracks and songs picked. Who would be interested in this product? Why? What sets this product apart? What are realistic things to demo? What are the limitations of the demonstration system? I need to try it to fill in the rest! Present the plan "I am going to record audio from a streaming movie, college football, youtube video, podcast. All of this will be done using the provided digital connection, then RCA cables. You might not hear the difference in this video, but I will tell you what I hear. I will also use the bluetooth connectivity for audio. 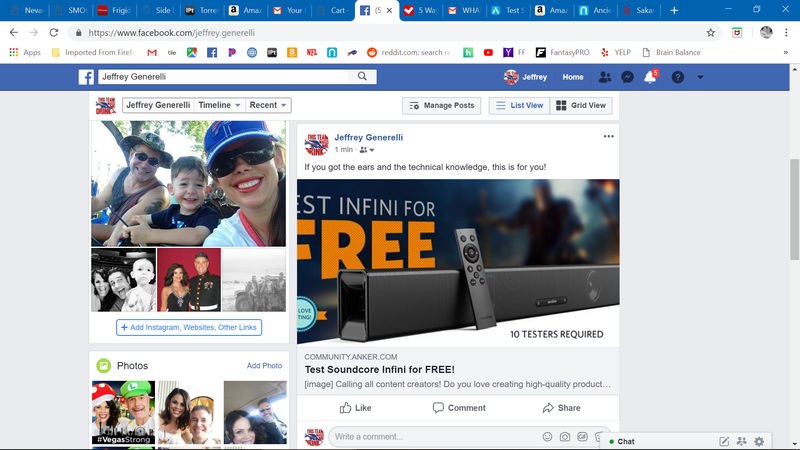 I am really excited to use the bluetooth since I think it is great to use one set of speakers for TV type content and for my music"
run through the above tests giving some commentary on digital vs. RCA and sound quality of an action movie (requiring good bass) and conversation. 3. 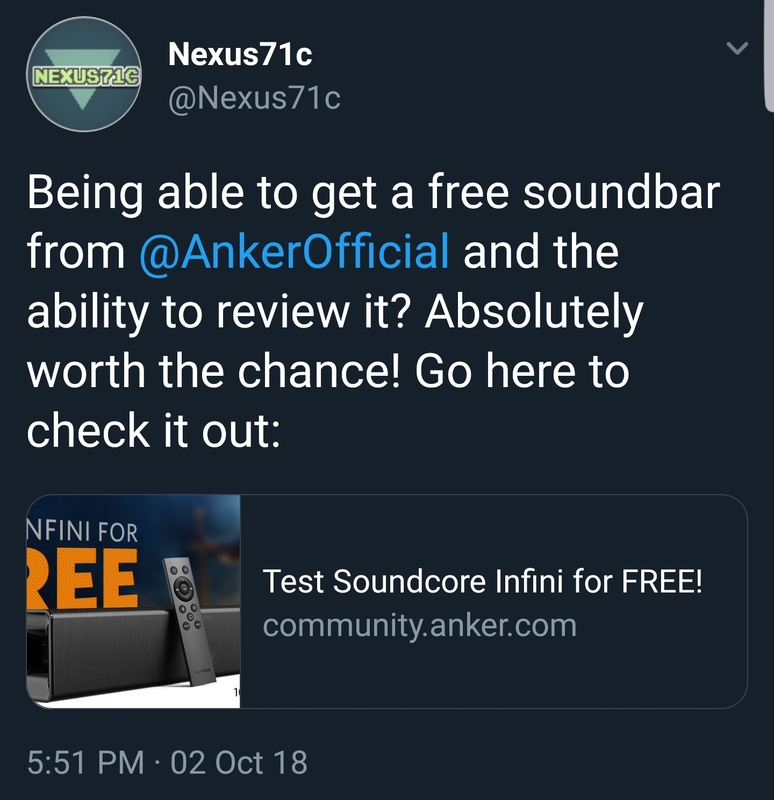 Unbox product and transition to a rotating shot of the soundbar itself, whilst detailing the specs and features of the Infini, as well as the overall build quality. 1. Plug it up and test the audio quality using Bass and Treble audio samples on each channel/output available. 2. Play royalty free music as a secondary test. 3. Play a video game to test the overall surround sound ability of the sound bar. 5. Show comparisons of the performance of the sound bar versus a two-speaker system, a straight out of TV experience, and even against another sound bar. 1. Results of each test discussed at detail. 2. Overall impressions of soundbar. The end result of how the video will turn out could be slightly different from the plan, but overall that's how it would go. Thanks for the chance! 4. Give opininion and points from scale 10. 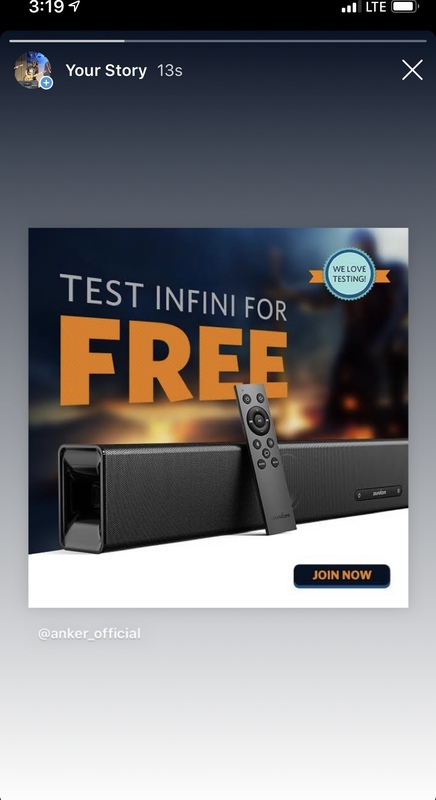 I would love to test the Infini! My plan a review would be to first show an unboxing of the Infini. 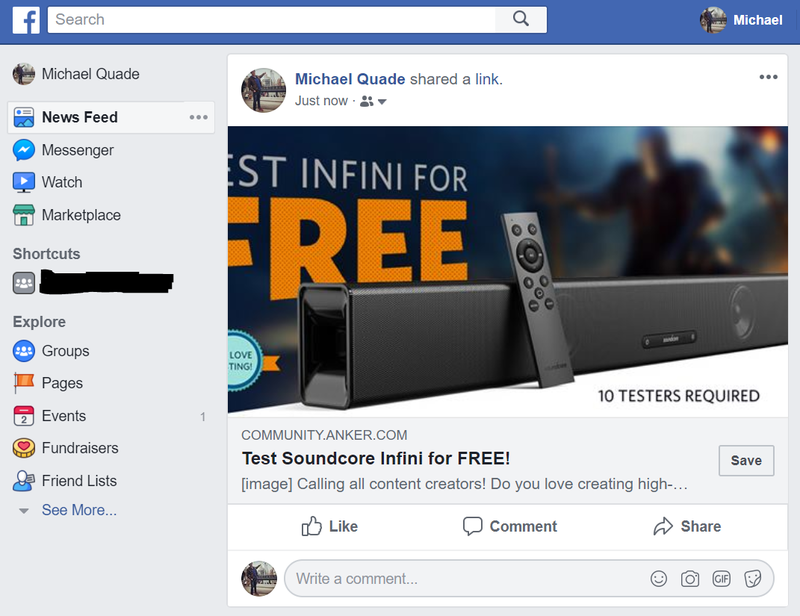 Then I would test sound quality (treble, mids, and bass), Max and Min volume, Ease of use, and I would compare the sound to the sound of the built in TV speaker. Finally I would give my opinion on the product. I am high reviewer of Amazon and is a top 10% Amazon buyer. 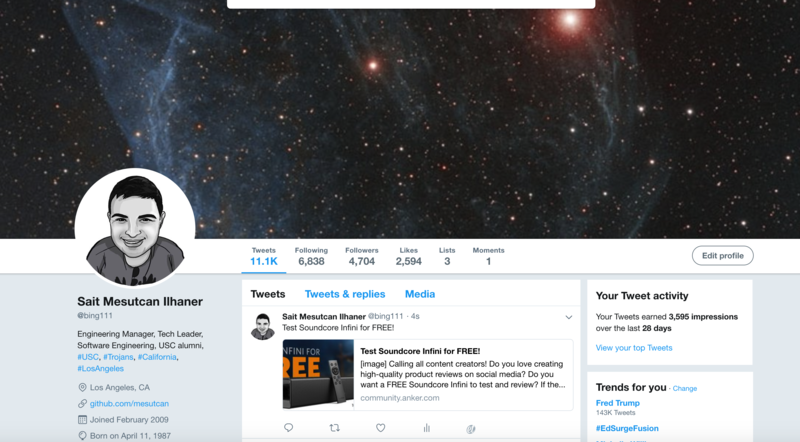 My Black Friday twitter account as well as 4,000 followers on my personal twitter account will be used to help amplify my review. I’m also a 10+ years poster on major deal fourm. Anker products reviewed in the past: Battery charger, eufy robot vacuum, car camera, backup camera. My plan is to create content to share on social, post a deal SD, Amazon review, and other tech forums I’m associated with. 3) More immersive gaming - Big screen, check. Bigger, better sound, that's up to you. It would be connected to my projector via aux cord for gaming (PS4 of course), and I'd use bluetooth to connect my phone to it. I've been considering buying a sound bar...but as a college student I'm low on money. 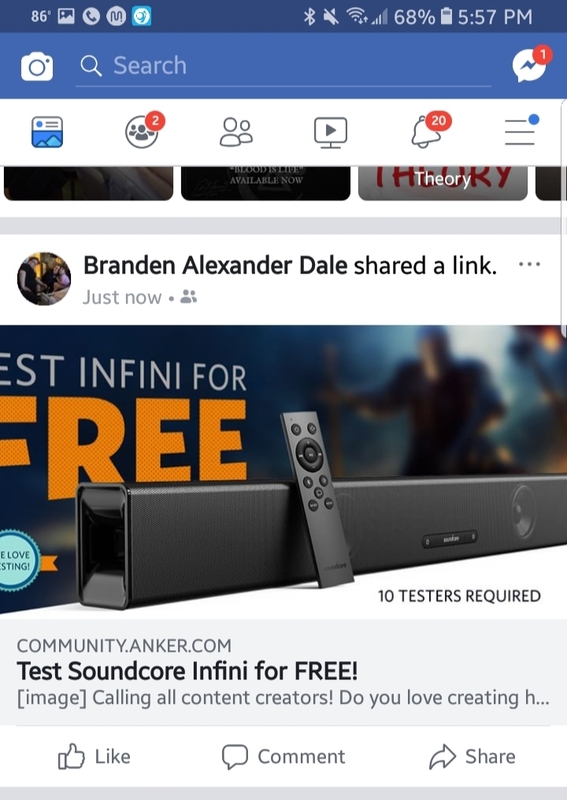 The Soundcore Infini would complete my dorm theater. Sound Test - Testing out different sounds to hear the speaker/bass response. Recordings of speaker in different rooms/environments. Obviously using my wonderful roommates as mock partygoers. Music Jam - Here's the part everyone has been waiting for... Dropping some sick beats on the new sound bar! Anecdotes - Best usages IMO (ie. movies, tv, gaming, music), and best settings for those different usages. Wrap-up/Review - A quick recap summary of everything discussed. What I like most, what Anker can improve upon for future models. 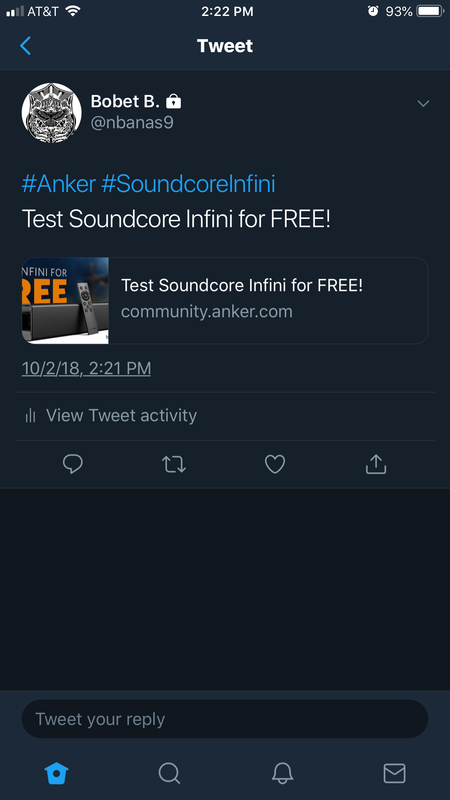 A BIG thank you to Anker for the Soundcore insider opportunity!! *Done with a high quality mic to try and replicate the sound quality as best as possible. Would love test this on my new 65 inch Samsung 4K! I would assess how the soundbar handles excerpts from Blu-ray movies, including chapters from Star Wars: Episode I, as well as different musical tracks, including "Fast Car" by Tracy Chapman, "New Dorp. New York" by SBTRKT and more. The speaker is positioned about two meters away from the listener, with the panel assessing overall quality. I would check how easy it is to use the connections, calibration options, on-screen and front panel displays, as well as the manual and any other instructions that come with the product. I would assess the remote control to determine how easy it is to use for common functions. While not as crucial as with other home entertainment devices such as a Blu-ray player or PVR, the remote is still an important part of the functionality of any home entertainment unit. I look at button size, shape, color and grouping for ease of understanding. I would measure the amount of power the soundbar uses when in standby mode. 4)Ger the feedback on the sound quality from the group. I love testing products out. I have tested products for ZTE. I am very passionate about technology. I am sort of audiophile and would love to test out the speakers. I own lots of iem and headphones. I use them listening to music and movie. I want to test out how these speakers sound compare to TV speakers, headphones and IEMS. 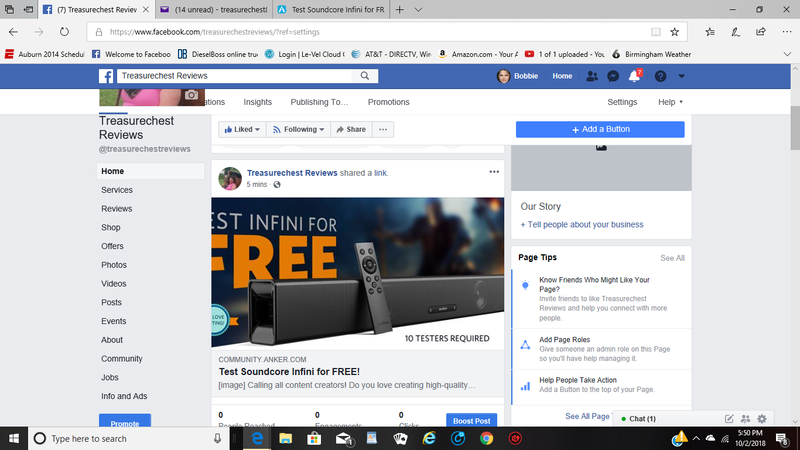 I will be posting unboxing and evaluation of feature in YouTube and audiophile sites where there is huge crowd just audio focused. I have shared about this is my Twitter. 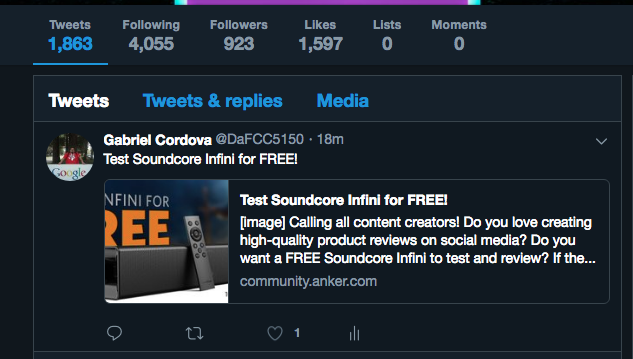 So we would love to have the opportunity to test the soundcore infini, we would start our review with pictures and video followed by this test plan. 4 test the soundcore out on the PC while gaming. 9. Full video review on the specs, sound and how it compared on the TV for shows and movies to the PC for games and music.